Alplodge i Interlaken, Schweiz: Bestill nå! Free cancellation till 28 days before arrival date. If there are cancellations less than 7 days before arrival date there is a 100% charge for the stay cost. 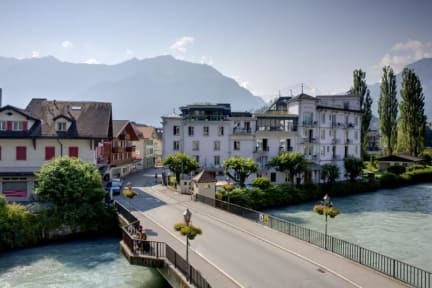 Place of jurisdiction is always Interlaken - Switzerland. All reservations must be fully pre-paid before check-in. 30% of the total cost need to be paid 28 days prior to arrival date. The remaining 70% of the total cost will need to be paid 7 days prior to the arrival date. We will send you a link to our secure payment site, where you can make the payment by credit card, or our bank details. 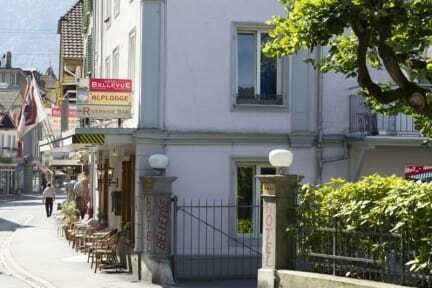 We are a non smoking backpackers hostel in the centre of Interlaken. All rooms and dorms have a sink with hot & cold water, and we also have rooms with shower/WC ensuite. We offer you free W-LAN and an internet terminal for free use as well. Use our fully equipped kitchen for free and relax in the common room (with TV) or on our roof-top terrace. We offer washing and laundry facilities. Small breakfast included in room rate. Our young, well travelled staff can help you to organize your adventure trips (river rafting, bungy jumping, canyoning, paragliding, mountain trekking, snowboarding, sledding, heli-skiing, ice climbing and many more). Check-in is from 15.00 - 22.00 daily. If you arrive earlier, you may store your luggage at the hostel. For late-arrivals we have a key-box located at the entrance.